Don’t let their cute jackets fool you: These gifted huskies could hold their ground with Olympic champions! Don’t forget a camera on this stunning helicopter excursion! You’ll want it to share this alien landscape with your family and friends! These pups live to mush: Join them on the upper glacier to see what it’s all about! Elite canine athletes will be waiting excitedly for your arrival! After all, they enjoy sledding almost as much as you will! At the upper reaches of Herbert Glacier, you’ll meet expert mushers for the ride of a lifetime! The Juneau Icefield can’t quite be described appropriately: You just have to see it to believe it! No need for water purification here! This is some high-quality H2O! Seasoned helicopter pilots will lead the way to some of the most stunning portions on the entire glacier, so just sit back and enjoy the exciting flight! “Ready when you are!” The teams get so excited as preparations are being made for the sled ride. Glacier ice absorbs all the colors of the spectrum, except blue! So it scatters the blue light to create some impressive displays. The photos and memories from this one will resonate with you whenever you reminisce about your Alaskan vacation. Your view from the sled. Enough time for everyone to have a turn at mushing the sled, if you choose. Fortunately there is parking available right next to the dog camp! You’ll realize quickly the bond between musher and his team – a very unique relationship. Yep, this dog ride is on snow! And you won’t believe how strong these guys are. Chat with local mushers about their racing experience and what it takes to run a 1,000 mile race in minus 30 degrees. There will be enough time to interact and thank your four-legged guides personally! No crowds up here! The advantage of the extra landing lets you experience two tours in one. The extra landing on the lower icefield showcases some really amazing glacial runoff areas. Don’t forget your sunglasses. Many huskies have adapted to the sun by evolving dark circles around their eyes, but you’ll want to bring your shades! Break for a cool-down. The lucky guys are fortunate to be able to spend their summer doing exactly what they love in a climate that suits them. Your chariot awaits. Reboard the helicopter after the sled ride to continue the adventure to the lower part of Herbert Glacier for stop number two. You’ll undoubtedly leave with a deep respect for these amazing athletes. This popular Juneau shore excursion combines an incredible helicopter flight up to Herbert Glacier with a uniquely Alaskan dogsled ride with husky dog teams - but then takes it one step further. Since you've already made it this far, this particular tour maximizes your helicopter flightseeing opportunity by flying to a remote icefield on Herbert Glacier, giving guests the chance to get out and experience the rugged glaciated terrain up close. The Helicopter Dogsledding with Extra Landing is really the ultimate combination tour, and if you only have one chance to go flightseeing while in Alaska, then this tour is going to be the one you want. For a bit more cost, it takes all of the elements from various flightseeing options and bundles them into one comprehensive outing. In many ways, this half-day Juneau shore excursion combines the elements of the shorter Helicopter & Dogsled Glacier Excursion with the popular Icefield Excursion to give you the best of both worlds. This allows you to experience all of the elements of glacier dogsledding, but the extra landing provides ground-level insight into the intricacies and characteristics of glacier movement that you would miss from the air. Why incorporate the second landing? The pictures may do it more justice than our description, but this area is marked by the iconic blue glacier ice, deep crevasses and ice falls on a massive scale. It allows you the opportunity to explore this rugged landscape, adding some remarkable photos to your collection. Many shorter helicopter options revolve specifically around this type of terrain, and this particular tour ensures that you don't miss it while joining the dogsledding tour. Looking for a bit shorter of a helicopter option out of Juneau? 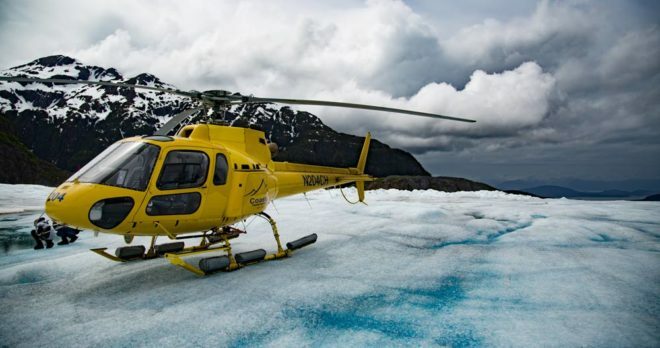 Take a look at the Helicopter & Dogsled Glacier Excursion! Stay Airborne! Check out the Neets Bay Bear Viewing & Flightseeing Tour in Ketchikan for wildlife and wind time!